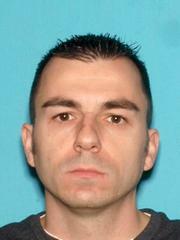 Wanted: Kristopher Dohm, 36, WM, 5'7, 150 lbs, brown hair, brown eyes. Abducted 2 sons in gray Nissan Pathfinder. The New Jersey State Police and the Hopatcong Police Department are seeking the public's assistance in locating Kristopher Dohm. Dohm is suspected of removing his sons, Parker and Jaxon Dohm, and leaving New Jersey, which is in violation of a custody agreement. Kristopher Dohm may have altered his appearance and altered the appearance of his boys by cutting their hair. Kristopher drives a 2009 grey Nissan Pathfinder with N.J. plate S17CKV. Anyone with information is asked to contact Hopatcong Police Department at (973) 398-5000 or the New Jersey Regional Operations and Intelligence Center at (609) 963-6900 ext. 1.